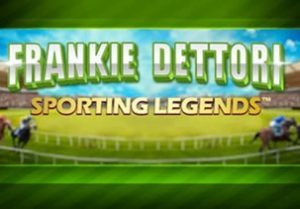 Enjoy a day at the races in Frankie Dettori: Sporting Legends, a 5 reel, 25 payline slot game from Playtech. Look out for wilds that pay up to 400 times your stake, galloping wild respins with multipliers of up to 7x and a free spins round where your wins could be doubled or even trebled. You’ll also have a chance to land 1 of 3 progressive jackpot prizes. Get under starter’s orders on all devices from between 25p and £625 per spin. Frankie Dettori’s Magic Seven has proved enduringly popular and this sequel sticks to largely the same formula. The design here isn’t particularly flashy - with grandstands either side, you’ll see simple green A to 10 playing card symbols and horse shoes, helmets and rosettes spinning around the reels. Galloping Wild Respins feature - these are triggered by landing a fully formed stacked wild on reel 1. The stacked wild then moves 1 reel to the right and a respin is awarded. If you land a winner, the process is repeated. Each respin increases a multiplier which starts at 2x before rising to 3x, 5x and 7x. The respins continue until you have a winless respin or the stacked wild drops off reel 5. Golden Derby Free Games feature - to trigger these, you’ll need to land 3, 4 or 5 of the winning post scatter. You’ll receive a payout of 5, 20 or 100 times your total stake before starting the round. Then choose the red, yellow or green horse. A race then takes place above the reels during your free spins. Reel 5 is filled with red, yellow and green horse wilds. Every time 1 lands, the associated horse moves closer to the finish line. For example, land 2 red wilds on reel 5 and the red horse moves 2 spaces in the race. Your free spins continue until the first horse reaches the winning post - if your chosen horse wins, all your payouts from the free spins round are trebled. If it comes second, the payout is doubled. Sporting Legends also offers the chance to win 1 of 3 jackpot prizes as there are Daily, Weekly and Sporting Legends Jackpots - each of which are triggered at random. Just like the original, Playtech has kept things simple as far as the design of Frankie Dettori: Sporting Legends is concerned. It’s certainly no thing of beauty. The features aren’t bad though and we managed to land them regularly. We wouldn’t describe this as a thoroughbred of a game. It can serve up some decent enough entertainment though if you’re a fan of the Sport of Kings. T&Cs Apply 18+. New Customers Only. Min £20 deposit. Max bonus £500. 20x (deposit + bonus) wagering reqs apply. Contributions to wagering reqs vary by game. Bonus valid for 30 days (bonus + winnings removed). Certain games and payment methods excluded. Bets covering 67% or more of Roulette table don’t count to wagering. T&C’s apply.